Saudi Arabia's King Salman Center for Relief and Humanitarians Aid (KSRelief) has donated 7000 tonnes of dates this year to 30 countries and United Nations World Food Program (WFP). The donation is part of the government aid program to distribute dates in 2018, This aid includes 4000 tonnes of dates to World Food Program and another 3000 tonnes of dates to more than 30 countries around the world. - In the last 2 decades, Saudi Arabia donated 65.9 Billion US Dollars aid reaching more than 80 countries around the world, Saudi Arabia is well known for its aid program as they provide its aid all over the world. - Kingdom of Saudi Arabia has the highest number of date palm trees in the world, As per estimation it produces 25% of the world's date production. 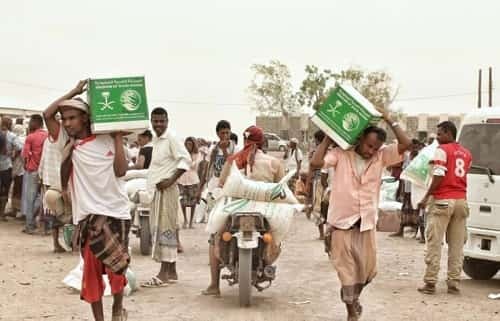 - The King Salman Humanitarian Aid and Relief Center was founded in 2015, In line with its humanitarian spirit and as a means of effectively distributing aid, Saudi Arabia has long been a regional leader in humanitarian affairs and has demonstrated a profound commitment to supporting those most in need around the world.